Nigerian musician, Damini Ogulu aka. Burna Boy, has postponed his December 17 concert due to the recent robbery allegations levelled against him. The reggae artiste has been accused of contracting a criminal gang to rob and brutally assault another singer named Mr2kay who was attacked in a room at the prestigious Eko Hotel and Suites in Lagos State. The artiste, however, has described the allegations as unfounded and are yet to be proven. 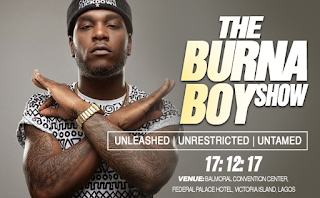 The promoters of the show, Bavent Street Live, said a new date for The Burna Boy Show will be communicated in the near future as all tickets purchased will remain valid, and however, fans have the option to receive their full refund from the ticketing partners immediately.